The Cobra CPI 2590 is a professional grade 2500 watt power inverter. 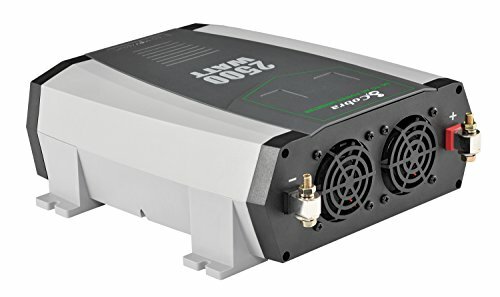 This inverter provides 2500 watts continuous and 50000 watts peak household electrical power, allowing you to power up office equipment and household appliances such as TV sets, coffee pot, a small microwave oven, a mini-fridge that draw up to 2500 watts at the same time from your car, truck, RV or boat. Ideal for the cross country professional driver or RV enthusiast that needs all the conveniences of home in the vehicle. In addition it includes a 5v 2.1a USB output ideal for using and charging tablets, smart phones and many other USB powered devices. The unit also features a digital display that illustrates the vehicle's battery voltage and device connected current consumption in watts on a large led display. The inverter incorporates all the protection circuitry for the unit and the device connected to it. Also, the inverter supports a remote on/off panel switch (sold separately) for an out of the way installation. The voltage from your inverter is a little different than the voltage in your home. The voltage in your home is called a “sine wave”, while the voltage from the inverter is a “modified sine wave”. Because of this difference, you will need a meter that measures “true RMS” voltage. If your meter does not measure “true RMS”, then it will read low. If it does not say “true RMS” on the front of your meter, then it is not a true RMS meter and it will read low. ON-THE-GO - Turn your vehicle in a mobile power source with a strong source of dependable power. Create useable sources for your on-the-go needs. From Tailgates, to Campgrounds Cobras CPI890 will power your trip.